Ever wondered how to turn biomass into usable products? Or how to 3D print a body part with biomaterials? Or how to safely extract, store, and refine petroleum products? Or how to develop innovative catalytic processes? Perhaps you’re more interested in tissue regeneration, reaction kinetics, or controlled drug delivery? 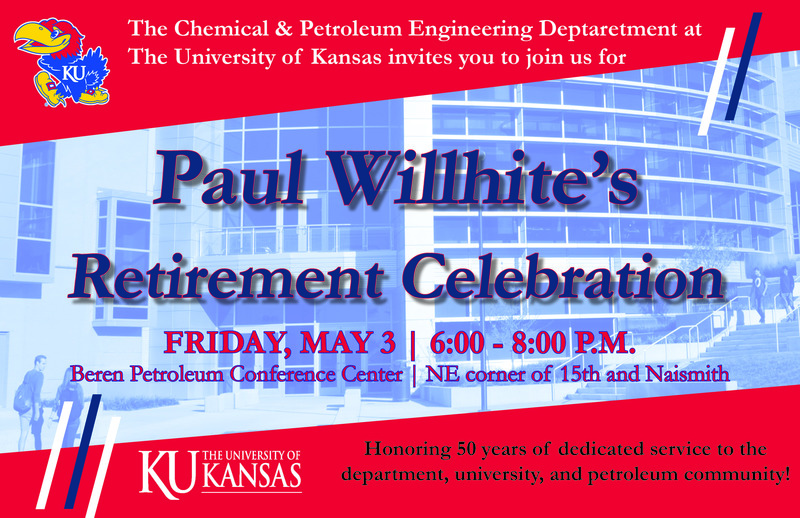 Well look no further than the Department of Chemical and Petroleum Engineering here at The University of Kansas! Our highly decorated faculty members have both the classroom and laboratory experience needed to prepare you for a bright and promising future career in either Chemical or Petroleum Engineering in these specific types of research groups plus many more. We offer degrees ranging from BS to PhD in both fields of interest. Let us tell you a little bit about our talented professors. On the Chemical engineering side, our main lab is the Center for Environmentally Beneficial Catalysis which is run by two of our Distinguished Professors, Bala Subramaniam and RV Chaudhari. Our newest addition to the CEBC family is Prof. Mark B. Shiflett, who joined us from DuPont. Many of our other faculty members are also doing innovative research there as well, such as Juan Bravo-Suarez who heads up the Bravo Research Group where they are working on heterogeneous and multifunctional catalysis, Kevin Leonard, an electrochemical specialist who leads The Leonard Lab, Karen Nordheden who is a senior member of the IEEE, Aaron Scurto whose group is working on alternative solvents and biomass processing, Franklin (Feng) Tao who studies catalytic reactions at the molecular level, and Laurence Weatherley, the Distinguished Chair of the CPE department and a process engineering specialist. Outside of the CEBC, Dr. Kyle Camarda’s research includes process systems engineering, product design, optimization and chemical process design. Bio-Fuel and Fuel Cell research in the CPE department are done by Susan Williams and Trung Nguyen. In her lab, the Stagg-Williams Group, Dr. Williams and her team specialize in the production and characterization of alternative fuels such as bio-fuels made out of algae and other organic materials. Prof. Trung Van Nguyen’s lab, the Fuel Cell Test Lab researches fuel cells and large based electrical storage. Dr. Nguyen is international recognized as one of the top researchers in this field, and has presented his research all around the globe. With a Bioengineering focus, Our newest two professors have a Bioengineering focus. Dr. Jennifer Robinson joined us from Columbia University and is currently researching elucidate hormonal effects on structure-function relationships of musculoskeletal tissue matrix. Dr. Mei He joined us from Kansas State University and researches innovative bioengineering solutions to human health via device-level fabrication, material-level characterization, and biomolecular-level quantitation. Dr. Stevin Gehrke’s work can often be found at his KU Hydrogel Lab where his group is working on polymer science, bio-material, and drug delivery. Prof. Prajna Dhar’s lab is called the Molecular Engineering and Interfacial Nanomedicine Lab, and the name speaks for itself. Prof. Arghya Paul also works with nanomatericals; his lab is called the BioIntel Lab, and his research is geared toward stem cells, gene therapy, and 3D printing biomaterials. Focused in the Petroleum engineering, two of our Distinguished Professors, Dr. Paul Willhite and Dr. Don Green (now retired) founded the Tertiary Oil Recovery Program which is located right here in the C&PE department. Paul Willhite literally wrote the book on Waterflooding. The current director of TORP is Prof. Shahin Negahban, an experimental fluids expert. Some of our other Petroleum focused professors include Prof. Reza Barati, whose research can be found at The Unconventional Research Lab, fuel specialist Prof. Xiolia (Laura) Li, computational expert Prof. Masoud Kalantari, and Prof. Shapour Vossoughi who specializes in enhanced oil recovery. Also associated with the CPE department are two co-appointed with Pharmaceutical Chemistry faculty members. Prof. Cory Berkland works in the MRB building and researches therapeutic particles advanced drug delivery systems at his lab. His aerosol drug delivery systems have been revolutionary to the field, and he has several start-up companies associated with his patents. Our newest addition to the CPE faculty team is Brandon DeKosky who works over in the Simons Research building. His research effots include the investigation of immune protection against persistent viral infections and the development of rationally designed biomaterials. With our state-of-the-art facilities, renowned faculty, and helpful office staff, you can’t go wrong joining the Department of Chemical and Petroleum Engineering Department in the School on Engineering at The University of Kansas!